Smart TV is basically a concurrence between computer and social TV which allows users to use all features presents in computers or smartphones. Smart TV offers various features such as internet accessibility, storage capacity, GPS system and other entertainment features such as games, music and other. Smart TV is integrated with internet connection which allows access to a number of popular websites including Netflix, YouTube, Amazon Prime and Hulu. In addition to this, smart TV is currently facing many technological transformations such as motion control. Adoption of smart TV by advertisement media is a key trend which is expected to lead smart TV generation to the next level. In terms of revenue, global smart TV market is anticipated to flourish at a compound annual growth rate (CAGR) of 8.5% over the forecast period i.e. 2017-2024. Global smart TV market stood at revenue around USD 260.2 Billion in 2016. Rising disposable income of consumers, growing population and changing lifestyles of middle class population are some major factors which are expected to foster the growth of global smart TV market during the forecast period. Geographically, global smart TV market is segmented into five major regions i.e. North America, Europe, Asia Pacific, Latin America and Middle East & Africa region. 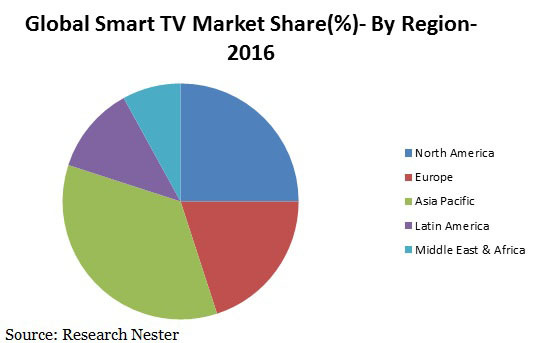 Among these regions, Asia Pacific region is the dominating market of smart TV and is expected to continue its dominance over the forecast period owing to the increasing demand for smart TV by end users and presence of fastest growing economies such as India and China. Joint venture of lading players in order to provide more features in smart TV and to maximize the selling numbers of products is one of the major factors driving the growth of global smart TV market. Additionally, industry leaders are making high investment in technology to improve the overall performance of smart TV. Such technological development is further attributed to drive the growth of global smart TV market. Moreover, increasing number of internet users across the globe and rise in demand for internet connected multimedia devices is bolstering the growth of global smart TV market. Apart from this, global smart TV market is driven by rising disposable income of the consumers and their inclination towards high-tech devices. Such factors have led all major players to increase spending on innovation and development of consumer electronics which is further envisioned to propel the demand for smart TV. However, high cost of smart TVs is hampering the growth of global smart TV market. Moreover, rising adoption of personal computers over television is also hindering the growth of global smart TV market.